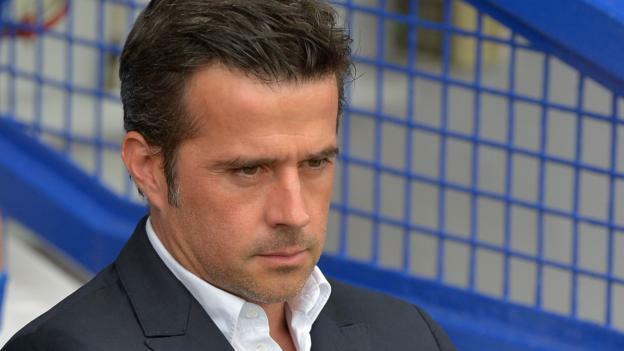 The Premier League has opened an investigation into a claim Everton made an illegal approach for Marco Silva when he was Watford manager. Watford reported their top-flight rivals for an alleged rule breach after the Toffees tried to hire the Portuguese last season. BBC Sport understands an independent law firm has been tasked with looking into the matter. However, it is unlikely it will report back to the Premier League before 2019. Silva, 41, was finally appointed Everton boss on a three-year deal in May, replacing Sam Allardyce. He had been out of work since being sacked by Watford in January, with the Hornets citing Everton’s approach as “the catalyst” behind their decision to dismiss him. The two clubs have gone through a failed mediation process. Despite the dispute, Watford sold Richarlison to the Merseyside club for a reported £50m in July. Silva was managing Watford when they signed the Brazilian forward for £11.5m from Fluminense in 2017. Everton have won one and drawn three of their opening four league games under Silva this season. The Hornets, now led by Spaniard Javi Gracia, have won all four matches and are level with Liverpool and Chelsea at the top of the table.